“Mira Moon Hotel, 388 Jaffe Road,” I barked upon hopping hastily into the cab from the drizzling rain. The driver nods. A short drive along the coastal way. A quick left turn. And we’re here. It’s not my first time in the city but I continue to be amazed. The sight of a 36-storey-high-building in front of me accosts my eyes. And as my gaze descends down to eye level, a hotel staff walks over, pulls the door lever and welcomes me with a smile. 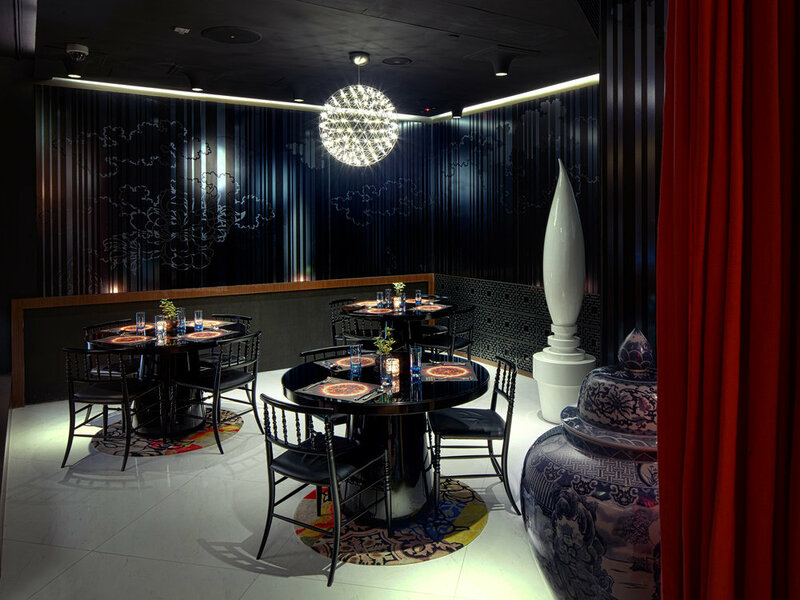 The lobby is designed with an oriental charm and a demure poise of a goddess. Intricate wooden carvings by local artisans as well as the wall claddings and the most auspicious red for a pop of vivaciousness embellish the common area here. Adding on to the great impression are three giant kinetic wood-carved lanterns that greet guests at the entrance, each with a golden sphere that carries a character from the story of the Chinese Moon festival. These spheres pirouette according to the time of the year and appear individually based on the phases of the moon. Once a year, all three spheres will pop out from their wooden shell to mark the day of the legendary Moon Festival. Legend has it that the Jade Emperor, ruler of the Heaven, has ten unruly sons. One day, they transformed themselves into ten suns, heartlessly scorching the Earth from high up in the heavens. Unable to stop their mischief, the Jade Emperor summoned a skillful archer by the name of Hou-Yi who braved himself to save the world by shooting down nine suns. His gallant efforts earned him the Elixir of Immortality. Hou-Yi gave the elixir to his wife, Chang-Er who consumed it and discovered that she could fly. She took flight to the moon and little did she know, she was unable to return to Earth to be with her one true love. She decided to send her magical companion, the Jade Rabbit to Earth to keep her husband company whilst she remained on the moon as the Moon Goddess of Immortality. The Jade Rabbit and Hou-Yi became good companions and they found themselves a home in one of the towers in Causeway Bay, Hong Kong ever since. This folklore tale has been repeatedly spoken about during the Mid-Autumn Festival when Chinese families gather for reunion dinners and cutting open the egg-yolk filled mooncakes that represents the golden full moon. While others regard this festival as a time to bond with loved ones and to enjoy the delightfully tasty morsels that are only available once in a year, Marcel Wanders took a different approach by incorporating the beautiful legendary story into the concept of Miramoon Hotel. Dubbed “the Lady Gaga of the design world” by the New York Times, renowned designer Marcel Wanders is thrilled about his first hospitality project in Hong Kong, a global creative partnership with international design company Yoo Design Studio whose founder is none other than Philippe Starck. A celebration of architecture, art and culture, Mira Moon’s design concept is a modern interpretation of the classic Mid-Autumn moon goddess story that features an elegant and sophisticated intermingling of contemporary style with elements of local folklore traditions. Marcel weaves his signature Dutch influences into this classic Chinese fable. The verdict; a fairytale cleverly brought to life by the romantic expressions of the characters through Chinese antique furniture, fabrics and prints. Each element in the hotel is carefully tailored and designed to represent the legend’s iconic personas. From the unique carpets and porcelain vases to the bespoke mosaic walls custom-designed for each room, the architecture invites you to allow your imagination to meander through the spaces and be captivated by the ancient love story. The theatrical confection of East and West showcases traditional crafts of Chinese artisans and a Euro-chic sensibility. “I strongly believe that by bringing the Dutch elements and Chinese culture together, in such a way, they strengthen each other,” Marcel shares. The hotel features some of the most amazing Chinoiserie influences that marry both the designer’s personal style and the beautiful oriental tapestry. A quick trip to the fifth floor takes you to the reception lobby where Marcel’s signature stands out immediately. Here, a matte grey sofa that undulates throughout the lobby is punctuated by Wanders’s highly acclaimed red Tulip chairs that give the space an undeniably ultra-modern feel. The ununiformed whimsical mix of classical patterns and blooming peonies with details plucked from traditional Dutch tiles creates a mind-blowing effect at the waiting area. Hanging, three red flying bunnies bring in a creative air to the traditionally designed space of a coffered wood ceiling and its intricate carvings. The ceiling design also resembles the textured patterns on the skin of the traditional lotus paste-filled mooncakes. According to the Chinese mythology, there isn’t a man on the moon – there’s a rabbit. If you didn’t know this cultural fact before checking-in, you’ll have grasped it by the time you’ve left. Marcel confides that there are little secrets that the design team has planned for guests to discover while staying in the hotel. There are a lot to see – bunnies everywhere! The “Where’s Waldo” element in the hotel calls for a search for the characters from the moon legend; rabbits, goddesses and archers peeping out from the carved ceilings, etched into mirrors or restrained into lamps and paper-clips. There’s also a profusion of peonies that have a mythological link the moon being translated into rugs, curtains and mosaic floors. As an important symbol in Chinese culture, the “king of flowers” represents love, affection and beauty. Another main attraction is the lift lobby design on each floor. Featuring the story of the Moon Festival, local artisans are commissioned to produce elaborated wood-carved panels that depict peonies and rabbits. Backlit, they look fantastic without looking kitsch. “Good Rabbits Don’t Smoke” - the sign points out that all 91 rooms at Mira Moon are non-smoking. There are a lot of interesting branding tools and strategies that are incorporated into the hotel’s total package. The room types are named based on the different phases of the moon – Full Moon Residence, Half Moon Residence, New Moon Studio and Moonshine Suite, the penthouse on the highest floor of the hotel. From simple details like the wrapper of the comb to the shampoo bottle, creativity thrives in Mira Moon. It is a perfect match for Hong Kong’s play-hard-work-hard attitude. Every element of this visual cross between Magical Mystery Tour and Through the Looking Glass has been carefully thought out from the first-floor lounge to the penthouse. House-music doowops in the lobby and bar accompanied by a ubiquitous violet scent specially created just for the hotel are ready to tickle your senses. And while your sensors are taken for a mid-autumn ride, you will also notice that spaciousness is something that is very much appreciated in this building. As Toploader’s Dancing in the Moonlight hits the woofers from Marcel’s music playlist, he reiterates that Mira Moon isn’t just a hotel but an experience visually retold through design.